Chapter 3 starts with the learning of the rest of the notes: D, E, F, high G and high A. 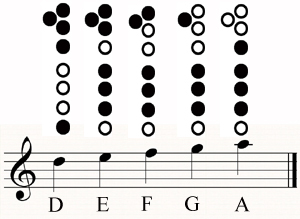 The rhythms are still really simple so that all the notes and fingerings are really embedded. Have a listen to the audio lesson and watch the movies.